Rounding off a hectic end to 2008 was a trip to visit Molly, currently on sabbatical in New York city. Joanna and I flew out to spend the final weekend before Christmas discussing projects and frequenting the local coffee shops, restaurants and bars. 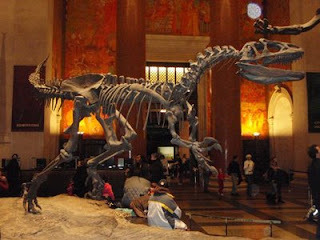 I took the opportunity to visit the American Museum of Natural History adjacent to Central Park after reading about its dinosaur collections in the Catcher in the Rye; pictured is an Allosaurus skeleton, which stands in the main entrance hall. Of particular interest was the Spitzer Hall of Human Origins which features a wealth of fossil remains and artefacts including a cast of the Laetoli footprints and a diorama of an Australopithecus afarensis nuclear family. Fittingly, the very focus of the New York trip was to discuss the on-going project to characterize natural selection between hominid species.